← As Long As We Are on the Subject…..
You can read about the golden tongued bishop here. “Why then, man, are you so worthless in your own eyes and yet so precious to God? Why render yourself such dishonor when you are honored by him? Why do you ask how you were created and do not seek to know why you were made? Was not this entire visible universe made for your dwelling? It was for you that the light dispelled the overshadowing gloom; for your sake was the night regulated and the day measured, and for you were the heavens embellished with the varying brilliance of the sun, the moon and the stars. The earth was adorned with flowers, groves and fruit; and the constant marvelous variety of lovely living things was created in the air, the fields, and the seas for you, lest sad solitude destroy the joy of God’s new creation. And the Creator still works to devise things that can add to your glory. He has made you in his image that you might in your person make the invisible Creator present on earth; he has made you his legate, so that the vast empire of the world might have the Lord’s representative. Then in his mercy God assumed what he made in you; he wanted now to be truly manifest in man, just as he had wished to be revealed in man as in an image. Now he would be in reality what he had submitted to be in symbol.” Read more here. 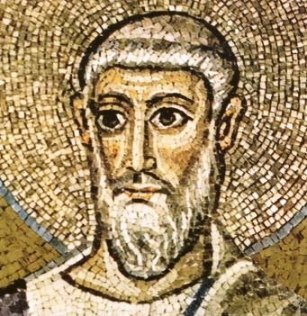 This entry was posted in Saints and tagged Catholic Saints, Doctors of the Church, Office of Readings, St. Peter Chrysologus. Bookmark the permalink.